In the midst of the FBI's announcement that it would not recommend charges against Hillary Clinton over her use of a private email server, Barack Obama joined the presumptive Democratic presidential nominee on the campaign trail. The pair met in North Carolina at the Charlotte Convention Center on Tuesday to highlight the progress they have made and describe what the future would hold with Clinton as president. "I am here because I believe in Hillary Clinton," Obama told the crowd. Obama first declared #ImWithHer back in June in a web video, saying, "I don't think there's ever been someone so qualified to hold this office." The duo's originally planned campaign event was postponed in the wake of the Orlando shooting. Clinton and Obama traveled to Charlotte aboard Air Force One, despite criticism from presumptive Republican presidential nominee Donald Trump, who tweeted, "Why is President Obama allowed to use Air Force One on the campaign trail with Crooked Hillary? She is flying with him tomorrow. Who pays?" In an election that's shaping up to be tight, Clinton needs the boost of a beloved president currently enjoying a relatively high approval rating, particularly given her lengthy time spent under the microscope for emails sent using private email servers while she was Secretary of State. In his speech, Obama focused on his foe-to-friend relationship with Clinton, no doubt hoping to ease the fears of voters hesitant to trust her. CLINTON: Thank you. (APPLAUSE) Thank you so much. Hello, Charlotte. (APPLAUSE) It is so great to be back in North Carolina with so many friends. (APPLAUSE) With Congresswoman Alma Adams and Congressman David Price and Congressman G.K. Butterfield. (APPLAUSE) And your next U.S. senator, Deborah Ross. (APPLAUSE) And your next governor, Roy Cooper. (APPLAUSE) And of course, with our president, Barack Obama. (APPLAUSE) Now, I — I feel very privileged because I’ve known the president in many roles — as a colleague in the Senate, as an opponent in a hard-fought primary, and — and the president I was so proud to serve as secretary of state. (APPLAUSE) But I’ve also known him as a friend that I was honored to stand with in the good times and the hard times, someone who has never forgotten where he came from. (APPLAUSE) And Donald, if you’re out there tweeting, it’s Hawaii. (APPLAUSE) (LAUGHTER) So over the years, we’ve had some memorable experiences together, like storming a secret meeting of foreign leaders at a global climate summit. OBAMA: That was fun. CLINTON: That was fun. (LAUGHTER) You should have seen the Chinese guards try to stop us. Now, they put their arms out and the president just went right through. Then they put their arms out and I went right under. (LAUGHTER) And the president, with that amazing smile of his, says, “Hey, we’ve been looking for you.” (LAUGHTER) Now, through it all as we went from political rivals to partners to friends, my esteem for him just kept growing. And so did my admiration for his brilliant wife, Michelle. (APPLAUSE) And those two amazing daughters that they have raised. (APPLAUSE) You know, my husband and I know a little bit about how hard it is to raise a child in the public eye, in the fish bowl of the White House. But the Obamas have done a fabulous job. (APPLAUSE) Malia, who just graduated from high school and celebrated her 18th birthday yesterday. (APPLAUSE) And Sasha, who has the energy and enthusiasm of a wonderful young woman. Now, I happen to think those two young women may be the most impressive accomplishment of all of our president. (APPLAUSE) And it’s one of the many reasons why it means so much to me personally to have the president’s support in this campaign. After all, he knows a thing or two about winning elections. Take it from me. (APPLAUSE) CLINTON: And he also knows that despite all the progress we’ve made under his leadership, and yes, we have… (APPLAUSE) We still have a lot of work to do. President Obama’s job, one that he did not ask for but was handed to him, was to save us from a second great depression, and that is exactly what he did. (APPLAUSE) Actually, I don’t think he gets the credit he deserves for saving our economy. (APPLAUSE) We’ve added 14 million private sector jobs. The auto industry just had its best year ever. Twenty million people now have health care. Clean energy production has soared. I could go on and on, but you get the idea. That is what leadership looks like. (APPLAUSE) So our next president has a different job to do: building on the progress that President Obama has made. We have to continue to take on deep structural challenges that existed long before the great recession. We see it here in North Carolina and across the country. Inequality is too high, wages are too low and it’s just too hard to get ahead. We need an economy that works for everyone, not just those at the top. (APPLAUSE) So we’re setting five big ambitious goals. First, under President Obama and Vice President Biden, we’ve had 75 straight months of job growth. (APPLAUSE) I want us to see 75 more. So in my first 100 days as president, we’ll make the biggest investment in new good paying jobs since World War II. (APPLAUSE) And when I say good paying jobs, I mean exactly that. Donald Trump thinks wages are too high. He actually stood on the debate stage and said that. And he wants to get rid of the federal minimum wage all together. Well, I think anyone who is willing to work hard should be able to find a job that pays well enough to raise a family. So we’re going to increase the federal minimum wage and give the middle class a raise. (APPLAUSE) That’s good for our families, good for our economy, and boy, is it good for our country. Now, second, we’re going to make college debt-free for all. (APPLAUSE) And we’re going to build on the president’s idea to make community college free. (APPLAUSE) And we’re going to help millions of people struggling with existing student debt save thousands of dollars. (APPLAUSE) Third, we’re going to rewrite the rules and crack down on companies that ship jobs overseas and profits to go with them. Let’s reward the companies that share profits with their employees instead. (APPLAUSE) And we’re going to defend and strengthen the tough reforms President Obama put in place on the financial industry, not tear them up like Donald Trump says he’ll do. We need to make sure that Wall Street can never wreck Main Street again. (APPLAUSE) Fourth, we’re going to make sure that Wall Street corporations and the super rich pay their fair share of taxes. (APPLAUSE) It is just plain wrong that a millionaire can pay a lower tax rate than their secretaries and we’re going to stop it. And oh, by the way, we’re going to keep asking to see Donald Trump’s tax returns. (APPLAUSE) CLINTON: And finally, we’re going to step up and respond to the way American families actually live and work in the 21st century. Our families, our workplaces have changed, so isn’t it time that our policies change, too? AUDIENCE: Yes! CLINTON: Now Donald Trump can accuse me of playing the woman card all he wants, but if fighting for equal pay and affordable childcare and paid family leave is playing the woman card, then deal me in! (APPLAUSE) And, you know, most of all — most of all… AUDIENCE: Hillary! Hillary! Hillary! CLINTON: You know, most of all, though, we’re going to build on the vision for America that President Obama has always championed. A vision for a future where we do great things together not as red states and blue states, but as the United States. (APPLAUSE) When I look at President Obama, I see a leader with heart, depth, and humility. Someone who, in spite of the obstruction he has faced, still reaches for common ground and common purpose. (APPLAUSE) Now some of you might remember that he and I competed against each other as hard as we could back in 2008. But when it was over, I was proud to endorse him and campaign for him. (APPLAUSE) And I’ll never forget when he called me the Sunday after the election asking me to come to Chicago. It turned out, he wanted me to be secretary of state. And I don’t think anybody saw that coming, especially me. And as I traveled on behalf of our country, a lot of people would ask me how President Obama and I could work so well together after being such fierce competitors. In some places, you know, the person who loses an election gets exiled or executed, not asked to be secretary of state. But President Obama asked me to serve and I accepted. You know why? We both love our country. (APPLAUSE) That is how our democracy is supposed to work. We just celebrated 240 years of our independence. In America we put common interest before self-interest. We stand together because we know we are stronger together. That is the kind of president Barack Obama has been. He has made difficult, even unpopular decisions for the good of our country. I’ve sat with him in the Situation Room and seen him make the hardest choices a president faces. He does it with steady, principled leadership. He’s a statesman, leading not just our country, but the entire world. It was his vision… (APPLAUSE) It was his vision and diplomacy that secured a historic global agreement on climate change, put a lid on Iran’s nuclear program, opened up Cuba, and rallied the world to curb the spread of nuclear weapons. (APPLAUSE) I saw him go toe-to-toe with the toughest foreign leaders and to give the order to go after Osama bin Laden. (APPLAUSE) This, my friends, is a president who knows how to keep us safe and strong. Compare that to Donald Trump. (BOOING) Can you imagine him sitting in the Oval Office… AUDIENCE: No! CLINTON: … the next time America faces a crisis? The world hangs on every word our president says. And Donald Trump is simply unqualified and temperamentally unfit to be our president and commander in chief. (APPLAUSE) CLINTON: So here in North Carolina, this election is our chance to say our country is better than this. In America, we don’t tear each other down, we lift each other up. We build bridges, not walls. (APPLAUSE) We don’t call the country we love a disaster or a laughing stock. We know America already is the greatest country on Earth. (APPLAUSE) Just think about those early patriots who met in Philadelphia that hot summer of 1776. They knew we would all rise or fall together. Now, nobody who looked like Barack Obama or me would have been included back then, but we’re here today because the story of America is the story of hard fought, hard won progress. (APPLAUSE) So, I want you to remember that for 240 years, our history has moved in that direction, slowly at times, but unmistakably. As the president has reminded us, the arc of the moral universe is long, but it bends towards justice. So if you believe, along with me and with the president, that our best days of the nation are still ahead of us, please join this campaign. Take out your phone right now. Take out your phone and text join to 47246 or go to hillaryclinton.com. We are hiring organizers right here in North Carolina. (APPLAUSE) We’re going to fight for every vote in this state, and with your help, we’re going to win it. (APPLAUSE) So I don’t know about you, but we are fired up and ready to go. Ready to win this election. Please join me in welcoming the president of the United States, Barack Obama. (APPLAUSE) OBAMA: Hillary. Hillary. Hillary. Hillary. Hillary. Hillary. Hillary. Oh (ph). (APPLAUSE) How you doing Charlotte? (APPLAUSE) Are you fired up? (APPLAUSE) You ready to go? (APPLAUSE) I am — I’m fired up. (APPLAUSE) Hillary got me fired up. (APPLAUSE) She — she got me ready to do some work. So I hope everybody had a great Fourth of July. I love you back. (APPLAUSE) That — first of all, let me just say I like any excuse to come to North Carolina. (APPLAUSE) I just like North Carolina. (APPLAUSE) I love — I love the — I love the people of North Carolina. I used to — when we used to campaign here, I used to say even the people who aren’t voting for me are nice. (LAUGHTER) You know, that’s not true everywhere. (LAUGHTER) So you’ve got great people here and then you’ve got great food. (APPLAUSE) North Carolina’s got some food. In fact, I will find some place to stop and get some food before I head back to D.C. (APPLAUSE) I know y’all have recommendations, and no, I can’t go to your house to get the food. (LAUGHTER) Although I’m sure you’re an excellent cook. (LAUGHTER) And then, you’ve got great basketball. (APPLAUSE) You’ve got great basketball. We all know that. We all know that, but I’m not going to get in between all the Tar Heel and Wolfpack and you know. Yes, Blue Devils, see I — see because I’m not going to get into all of that. OBAMA: You just have great basketball in North Carolina. So I love an excuse to come to North Carolina. But I’m here for a simple reason. I’m glad to see our outstanding congressional delegation. You are lucky to have them. I’m glad you’ve got an outstanding candidate for the Senate and outstanding candidate for governor. (APPLAUSE) And I’m going to be working for them too, but I’m here today because I believe in Hillary Clinton. And I want you to help elect her to be the next president of the United States of America. That’s why I’m here. (APPLAUSE) Now, this is not… CROWD: Hillary! 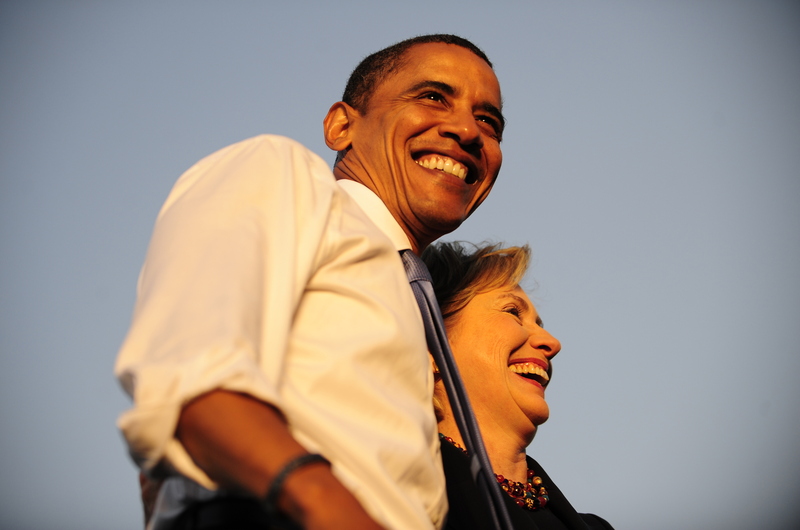 OBAMA: Now, as Hillary mentioned, this is not the first time we campaigned together. We went up to New Hampshire after our primary in 2008. We went to Unity, New Hampshire, just in case people miss the point. (LAUGHTER) That was the name of the town, Unity, New Hampshire, and we had gone through what was one of the longest, toughest primaries in history. And primaries are always tough because you’re arguing with your friends instead of the folks you disagree with. Sometimes, you’ve got to find things to disagree about even though you don’t really disagree. So we were crisscrossing towns from New Hampshire to Nevada. And as much as I had admired her when we served together in the Senate, I came away from that primary admiring her even more, because during that year and a half, I had a chance to see up close just how smart she was and just how prepared she was. (APPLAUSE) Especially since I had to debate her a couple dozen times. (LAUGHTER) And let’s be clear, she beat me like in the… (LAUGHTER) Now, you don’t have to rub it in. (LAUGHTER) You don’t have to rub it in, now. (LAUGHTER) You know, she — she beat me, you know, at least the first half and then I just barely could play her to a draw. I always had to be on my game because she knew every fact and she knew every detail. (APPLAUSE) And then during those 18 months, I saw the passion that she feels for anybody who’s experienced injustice, anybody who’s faced discrimination, anybody who does everything right and still can’t seem to get a fair shot, whether it was workers who had lost their jobs or kids unable to afford college. And you could tell it was personal to her because — because she had seen struggles in her own life, she had known challenges in her own life and she could identify and empathize with people who were doing the right thing and wanted to make sure that they got a fair shake. And then during the primaries, again and again, I saw how even when things didn’t go her way, she’d just stand up straight and come back stronger. (APPLAUSE) She didn’t give up. She didn’t pout. She just kept on going. She was the energizer bunny. She just kept on. And the bottom line is she had to do everything I had to do, but she was like Ginger Rogers, she had to do it backwards in heels. (APPLAUSE) And at the end of our contest, I saw the grace and the energy with which she threw herself into my campaign. Not because she wasn’t disappointed about the outcome of the primary, but because she knew there was something that was at stake that was bigger than either of us. And that was the direction of our country and how are we going to make sure that all the people who are counting on us could see a better life. (APPLAUSE) OBAMA: So we may have gone toe to toe from coast to coast, but we stood shoulder to soldier — shoulder to shoulder for the ideals that we share. So maybe Hillary was surprised, but I wasn’t surprised when I asked Hillary to represent our interests and our values around the world as America’s secretary of sate. I knew she would do a great job. (APPLAUSE) I knew she would perform. I knew the regard in which she was held in capitals all around the world. I knew that the minute she took that job, there was — there was a stature and a seriousness that would immediately mend some of the challenges that we had had around the world during that time. Now, let me tell you, North Carolina, my faith in Hillary Clinton has always been rewarded. I have had a front-row seat to her judgment and her toughness and her commitment to diplomacy. And I witnessed it in the Situation Room where she argued in favor of the mission to get Bin Laden. (APPLAUSE) I saw how — I saw how — how as a former senator from New York, she knew, she understood because she had seen it, she had witnessed it, what this would mean for the thousands who had lost loved ones when the Twin Towers fell. I benefited from her savvy and her skill in foreign capitals where her pursuit to diplomacy led to new partnerships, opened up new nations to democracy, helped to reduce the nuclear threat. We’ve all witnessed the work she’s done to advance the lives of women and girls around the globe. She has been working on this since she was a young woman working at the Children’s Defense Fund. She’s not late to the game at this; she’s been going door to door to make sure kids got a fair share, making sure kids with disabilities could get a quality education. (APPLAUSE) She’s been fighting those fights, and she’s got the scars to prove it. (APPLAUSE) And — and you know, Hillary and I shared — we shared a big hug the first time we saw each other after we finally realized one of the great causes of her career: finally guaranteeing access to quality, affordable health insurance for every single American because that’s something she got started. (APPLAUSE) And we picked up that baton and were able to get it across the finish line. The bottom line is she was a great secretary of state. And by the way, that — that’s not just my opinion, that was the view of the American people in and pundits throughout the time that she was serving as secretary of state before the whole political machinery got moving. You remember that? It wasn’t that long ago. It’s funny how that happens. Everybody’s thought she was doing a great job. That’s because she did do a good job. (APPLAUSE) But it — but it’s funny how the filter changes a little bit. Same person, done the same work. But you know, that — that — that filter’s a powerful thing. But you know, it — it wasn’t just what happened in the lime light that made me grow more and more to admire and respect Hillary. It was how she acted when the cameras weren’t on. It was knowing how she did her homework. It was knowing how many miles she put in traveling to make sure that America was effectively represented in corners of the globe that people don’t even know about. There wasn’t any — any — any political points to be had, but she knew that it was important. I saw how she treated everybody with respect, even the folks who aren’t quote/unquote “important.” That’s how you judge somebody is how do they treat somebody when the cameras are off and they can’t do anything for you. Do you still treat them right? Do you still treat them with respect? Do you still listen to them? Are you still fighting for them? (APPLAUSE) I saw how deeply she believes in the things she fights for. And I saw how you can count on her and how she won’t waver and she won’t back down. And she will not quit, no matter how difficult the challenge and no matter how fierce the opposition. OBAMA: And — and if there’s one thing I can tell you, Charlotte, is those things matter. Those — those — those things matter. I — I am here to tell you that the truth is nobody fully understands the challenges of the job of president until you’ve actually sat at that desk. Everybody’s got an opinion, but nobody actually knows the job until you’re sitting behind the desk. (APPLAUSE) Everybody can tweet, but nobody actually knows what it takes to do the job until you’ve sat behind the desk. (APPLAUSE) I mean, Sasha tweets, but she doesn’t think that she thereby should be sitting behind the desk. So you can’t fully understand what it means to make life and death decisions until you’ve done it. That’s the truth. But I can tell you this; Hillary Clinton has been tested. (APPLAUSE) She has seen up close what’s involved in making those decisions. She has participated in the meetings in which those decisions have been made. She’s seen the consequences of things working well and things not working well. And there has never been any man or woman more qualified for this office than Hillary Clinton, ever. And that’s the truth. That’s the truth. (APPLAUSE) CROWD: Hillary! OBAMA: So the bottom line is I know Hillary can do the job, and that’s why I am so proud, North Carolina, to endorse Hillary Clinton as the next president of the United States. (APPLAUSE) Now, I recognize to some degree I’m preaching to the choir. (APPLAUSE) I know I probably don’t need to tell anybody here why we need Hillary’s steadiness and her level-headedness and her brilliance and her temperament right now — right now, because we’ve been through some tumultuous times in this new century and we continue to face all kinds of challenges and change in the years ahead. And this November, in this election, you are going to have a very clear choice to make; between two fundamentally different visions of where America should go. And this isn’t even really a choice between left and right or Democrat or Republican. This is a choice between whether we are going to cling to some imaginary past or whether we’re going to reach for the future. (APPLAUSE) This is about whether we have an America that works for everybody, or just a few people. And Hillary is not somebody who fears the future. She believes that it is ours to shape, the same way it’s always been. Hillary understands that we make our own destiny as long as we’re together, as long as we think of ourselves not as just a collection of individuals or a collection of interest groups or a collection of states, but as a United States of America. She knows that. She knows that when it comes to our economy. Because she knows our economy works best not when it only benefits a few at the top, but when everybody’s got a fair shot at success. (APPLAUSE) As Hillary mentioned, look, when I came into office, things were not in very good shape, you will recall. (LAUGHTER) OBAMA: We were losing 800,000 jobs a month, pursuing by the way the same proposals that the Republicans are still peddling. And over the past six years, our businesses have created more than 14 million new jobs. We’ve cut the unemployment rate in half. Manufacturing jobs have grown for the first time since another President Clinton was in office. (APPLAUSE) By the way, and — and — and by the way, because they’re only talking about us being these spendthrift Democrats, I just want to point out we cut our deficit by nearly 75 percent. (APPLAUSE) They didn’t. They did not. Wages for families are finally starting to rise again. But we’ve got so much more work to do. Because in the 21st century, we’re not going to — we’re not going to help families, we’re not going to create jobs just by pretending that we can turn back the clock and women are going to somehow not be in the workforce anymore. And you know, people of color suddenly are not going to be competing and wanting a better future for their kids. We’re not going to suddenly ignore all the progress that’s been made over the last 30 years. We’re not going to build walls around America or put technology back in a box. We’re not going to reverse hard-won rights for women or minorities or Americans with disabilities to fully participate in the workforce. We’re not going to do that. If we’re going to give working families, all families a chance to succeed, we’ve got to make sure they can afford childcare, and they’ve got sick leave and paid leave. And we’ve got to make sure women get equal pay for equal work. (APPLAUSE) And we should make it easier, not harder for workers to organize for better wages and working conditions. And we shouldn’t eliminate the minimum wage. We should raise it high enough so if you work full- time you don’t live in poverty. (APPLAUSE) Each of these policies — the policies Hillary mentioned — would help working families feel more secure in today’s economy. She’s actually got a plan. It’s actually paid for. You can actually look at it. Now, the fact that we haven’t gotten all these ideas done, it’s not the fault of immigrants or unions or some liberal socialist scheme. It’s very simple. Republicans in Congress and Republican governors have been blocking these ideas for the last eight years. It’s that simple. (APPLAUSE) So — so, look, I — I just want to be clear. Not everybody votes on the economy. I understand there are other issues. But if your concern is who is going to look out for working families, if you’re voting your pocket book, if you’re asking who’s actually going to stand up for the guy on the construction site or the guy on the — in the factory or — or the woman who is cleaning a hotel room, or somebody who’s really working hard, the working family — if that’s your concern, this isn’t even a choice, because the other side has nothing to offer you. (APPLAUSE) The other side’s got nothing to offer you. (APPLAUSE) I — I’m going a little off-script here, but I just want to repeat this. If your concern is working people, then this is not a choice. I don’t care whether you’re white, black, Hispanic, Native American, polka dot, male, female — I don’t care. OBAMA: If what you care is who’s going to be fighting for ordinary folks who are fighting for a better life for themselves and their children, then I don’t know how you vote for the guy who’s against the minimum wage, against unions, against making sure that everybody gets a fair shot, against legislation for equal pay, against sick leave and family leave, against all the things that working families care about. So, if you’re voting for the other team, it’s not because of the economy. It’s not because of the economy. You’ve got to be — you’ve got to be clear about that. (APPLAUSE) I mean, even — even — even the Republicans on the other side don’t really know what the guy is talking about. (LAUGHTER) They really don’t. They really don’t. You ask them, they’re all like, I don’t know. And then they kind of duck the other way. Am I joking? No. So — so you can choose a path that divides us, with harsh rhetoric and pits working people against each other, all the while pushing policies that will just help folks at the top do even better, but that’s not helping working families. Or we can transform our politics so they’re responsive to working families, so that all people of all races and all backgrounds get a higher wage and all folks get quality healthcare and a decent retirement and all children in this country get a better education that lets them dream bigger than their circumstances. That’s what Hillary Clinton believes and that’s why I’m supporting her for president of the United States, and that’s why you should too. (APPLAUSE) Now — now, to me that in and of itself would be enough to make the choice. But we’ve got some other choices. You can go the path that denies climate change is real or you can choose a path where American jobs and businesses lead the world to combat it. You know, over the last seven years, we have doubled renewable energy in this country. We… (APPLAUSE) Remember — remember when we were all concerned about our dependence on foreign oil? Well, let me tell you, we’ve cut the amount of oil we buy from other countries in half. (APPLAUSE) Remember when the other team was promising they were going to get gas prices down in like 10 years? We did it. Did it. (APPLAUSE) So — so we have been able to shape an energy policy that’s good for families, good for your pocketbook. And with Secretary Clinton’s help, America ultimately led nearly 200 other nations to an agreement to save this planet for future generations. (APPLAUSE) Now, maybe — maybe you don’t care about this. Maybe you think 99 percent of scientists are wrong or, you can — you’re welcome. (APPLAUSE) But the point is, we’re not done with this, so where we go from here is up to you. You can vote with the climate deniers who want to tear up the agreements we’ve crafted and doom our kids to a more dangerous world, or you can vote to keep putting people back to work building a cleaner energy future for all of us. That’s part of what’s at stake in this — in this election. That’s one of the reasons I’m supporting Hillary Clinton for president. (APPLAUSE) You know, Hillary mentioned how we operate on the world stage. Now, let me just say, I know the other guy talks about making America great again; America is really great. (APPLAUSE) And just the other day, somebody was writing about, wow, when you look at the surveys in the world, turns out that when Obama came into office, the world didn’t think we were that great, but now they think we’re the greatest. (APPLAUSE) They think we’re the strongest. They think we’re the best- positioned. We — we were in a hole before I came into office, but right now, the world — the rest of the world thinks we’re pretty darn great. (APPLAUSE) And by the way, you can look that up; that’s a fact. That’s not like just something I just made up and tweeted. (LAUGHTER) So you know, there are actually like surveys done. They polled people so you actually know what people think, you don’t just assert it and it turns out that’s what they think. You can look it up. OBAMA: Part of the reason for that is because we had an outstanding secretary of state. (APPLAUSE) Part of the reason is that Hillary understood and continues to understand that just a bunch of tough talk doesn’t replace the hard work of diplomacy. A bunch of phony bluster doesn’t keep us safe. And she understands that we can’t retreat from a world that needs American leadership. That’s why she offers a smarter approach that uses every element of American power to protect our people and to protect our allies. She is and will be a stateswoman who makes us proud around the world. (APPLAUSE) She’ll deploy diplomacy whenever possible, but she also knows what it — what it takes to be a commander-in-chief and I know she will never hesitate to use force when it is necessary to protect us. (APPLAUSE) And she’ll know how to mobilize the world around the causes that we believe in, that we know are right, and make sure other countries pull their own weight. That’s strength, that’s leadership and that’s why Hillary Clinton has to be the next president of the United States of America. (APPLAUSE) I am with her. I am with her. You know, part of the reason why we are here is because we all share the belief that this country only lives up to its potential when every single one of us gets the chance to succeed. Black, White, Latino, Asian, Native American, young, old, rich, poor, Turkish American. (APPLAUSE) Gay, straight, male, female — all of us matter. All of us share the same creed, all of us pledge allegiance to the same flag. That doesn’t mean we have to agree on everything. We all have different ideas and beliefs, and that’s part of what makes America great. But I agree with Hillary that our democracy works best when there are basic bonds of trust between us, when we recognize that every voice matters. And the people who disagree with us most strongly love our country just as much as we do. You’ve never heard Hillary Clinton demonize other people. You haven’t heard her not be willing to engage in (sic) folks even when they disagree with her. You ask — you ask about folks in the Senate who are on the other side, they liked working with her, even though some of them had done everything they could to tear her down. When she was first lady, she still worked with them. And that brand of leadership is how we’re going to get things done, that’s how we can protect more of our kids from gun violence. (APPLAUSE) After Newtown — after Newtown, the other side blocked any new gun safety reforms. After Orlando, they blocked any new gun safety reforms. They’re not listening to 90 percent of the American people, Democrats and Republicans who support background checks and making sure somebody who’s on a no-fly list can’t actually go out and purchase an automatic rifle. (APPLAUSE) Hillary knows how to build coalitions and she knows we can take smart steps to protect both our rights and our kids so they can go to the movies or to church or to a nightclub or to school. And if you believe that too, then there’s no choice here; you’ve got to vote for Hillary Clinton. (APPLAUSE) Her brand of leadership can fix a broken immigration system so that it lives up to our tradition as a nation of laws and a nation of immigrants. You know, unless you’re a Native American, somebody brought you here. (LAUGHTER) (APPLAUSE) Somebody came here. You — you — you came from someplace else, now. So I just want to be clear about that. And not everybody had their papers straight when they came. (APPLAUSE) OBAMA: I’m just saying. And you know, there are millions of striving young people whose lives hang in the balance and they want to give something back to this country that they love. They want to serve in our military, they want to go to college, they want to be doctors, they want to cure diseases and for years the Republicans who run this Congress, they talk a good game about immigration reform and then they don’t do anything. And now they’ve picked a nominee who’s only plan is to build a higher wall. That’s not a plan. No, no, no. Hold on a second. I was waiting for this opportunity. Don’t boo. Vote. (APPLAUSE) Don’t boo. Vote. Booing doesn’t help. You need to vote. But if you care about a smart immigration policy that controls our borders and makes sure that it’s lawful but also gives everybody opportunity, this is your campaign. You’ve got to vote in this election. And you know what? If you don’t think your vote matters, if you don’t think the stakes are high enough, remember that just last month the Supreme Court could not — (AUDIO GAP) OBAMA: — decision involving immigration because the Republicans in the Senate had refused to just do their job and just have the courtesy to meet with a nominee that even they admit is one of the most qualified ever to be nominated for a seat on the Supreme Court, won’t even give him a hearing. Won’t even give him an up or down vote. They’d rather have their nominee for president choose his own justice to fill that seat. Don’t boo. Gotta vote. He wants to nominate a justice who views the world as he does. That’s not a good thing. That’s not what you want on the highest court in the land. The Supreme Court is no joke. The people who sit on that bench make monumental decisions that affect all of your rights. Our responsibilities and duties to each other as citizen affect every aspect of our daily lives. (OFF-MIKE) (APPLAUSE) This is not a reality show. This is not entertainment, this is real. This is not a reality show, this is reality. And being President of the United States means you have to deal with reality. When a crisis hits you can’t just walk off the set. You can’t fire the scriptwriter. You can’t be reckless. You don’t have the luxury of just saying whatever pops into your head. You’ve actually got to know what you’re talking about. You’ve actually got to do your homework. You can’t just kick out reporters. You can’t go to another country and if they ask you a question you don’t like just kick them out. Because you’re in another country. You’ve got to apply steady judgment. Even when things don’t go your way. You gotta make the tough calls, even when they’re not popular. And even when they won’t pay off right away. Or increase your poll numbers. You gotta be able to handle criticism without taking it personally. You just got to brush it off and get the job done. That’s some of what I’ve learned while serving as your president. That’s some of what Hillary’s learned as a Senator and as a Secretary of State. And that’s why I’m voting for Hillary Clinton to be the next President of the United States. (APPLAUSE) So let me — I know I’ve gone on too long. That’s what happens, you haven’t campaigned in a while you start just enjoying it too much. So let me just simplify this. And let me be blunt. I want to be blunt. Can I be blunt? I’m gonna be blunt. Hillary’s got her share of critics. That’s what happens when you’re somebody who’s actually in the arena. That’s what happens when you fought for what you believe in. That’s what happens when you dedicate yourself to public service over the course of a lifetime. And what sets Hillary apart from so many others is she never stopped caring. She never stopped trying. You know we’re a young country so we like new things. And I benefited from that culture, let’s face it. When I came on the scene in ’08 everybody said, “Well, he’s new.” They don’t say that now because I’m not. (LAUGHTER) But sometimes we take somebody who’s been in the trenches and fought the good fight, and been steady for granted. Sometimes we act as if never having done something and not knowing what you’re doing is a virtue. We don’t do that, by the way, for airline pilots. We don’t do that for surgeons. OBAMA: But somehow we think the president of the United States, let’s just get — I don’t know, who’s that guy? Come on. (LAUGHTER) And so as a consequence, you know, that means that sometimes Hillary doesn’t get the credit she deserves. But the fact is, Hillary is steady and Hillary is true, and she’s been in politics for the same reason I am, because we can improve other people’s lives by doing this work. And we don’t care about the slings and arrows that are thrown at us, because we know that’s how real change and real progress happens, and that we, if we’re willing to work hard, can finish — can — can bring about changes that make life better for some kid out there, some senior out there, somebody who’s unemployed out there. And it may take more than a year. And sometimes it takes more than a term. And sometimes it takes more than one presidency or even one generation. And yeah, that’s old-fashioned. I think she’ll fess up to that. But we want people to believe that their government can work and that their president cares. And that every child in this country should have the same chance that this country gave us. Because we weren’t born with a silver spoon. (APPLAUSE) And we know that behind all the division and sometimes angry rhetoric of this election year and all the petty bickering and the point-scoring and the punditry, the ordinary American — Americans are good. And they are generous and they are hard-working and they’ve got an awful lot of common sense. And we share a certain set of common values and hopes and dreams. That’s why I ran in 2008. And I believe in those values and those ideals more than ever. And I believe in you, the American people, more than ever. And I am more optimistic about our future than ever. And that’s why my faith — my faith is stronger about the simple American ideal as old as our founding, that people who love their country can change it for the better. I have seen it happen. I have run my last campaign. And I couldn’t be prouder of the things we’ve done together. But I’m ready to pass the baton. (APPLAUSE) And I know that Hillary Clinton is going to take it. (APPLAUSE) And I know she can run that race — the race to create good jobs and better schools and safer streets and a safer world, and that’s why I’m fired up. And that’s why I’m ready to go. And that’s why I’m with her. And that’s why I need you to work just as hard to make sure that Hillary Rodham Clinton is the next president of the United States of America. (APPLAUSE) God bless you, North Carolina. God bless you. (APPLAUSE) God bless the United States of America.